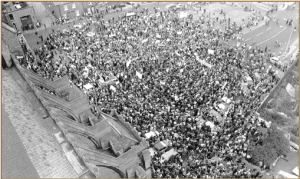 Part of the ‘Save Wood Quay’ protest demonstration on 23 September 1978—20,000 people from every part of the country took to the streets in an extraordinary show of public sentiment. 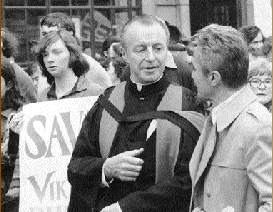 On 23 September 1978, the famous ‘Save Wood Quay’ protest march took place in Dublin city: c. 20,000 people took to the streets in an extraordinary show of public sentiment that is still firmly lodged in the collective memory today. At issue was the decision by Dublin Corporation (as it then was) to construct its new headquarters on a four-acre site right in the centre of the historic core of Dublin, beside Christ Church Cathedral. The site had been chosen as far back as 1961 but the location and scale of the new build were causing serious disquiet amongst conservationists, appalled at the impact it was likely to have on the oldest part of Dublin. Initially the fear was for the built heritage, Christ Church and the pre-Georgian streetscape of the area, but it quickly became apparent that this impact extended below the ground also, as the entire plot was a major archaeological site, the very core of the Viking settlement over which Brian Boru had lost his life in the Battle of Clontarf in 1014. The marchers came from every part of Ireland and from all social backgrounds and professions in an extraordinary display of national heritage outrage. Their mission was clear—to prevent the destruction of the delicate Viking archaeological layers that had been discovered at Wood Quay. But can an issue that caught the imagination of the entire country, which compelled ordinary citizens to take such emphatic action, really have been as simple as all that? And what was happening behind the scenes, out of the limelight? 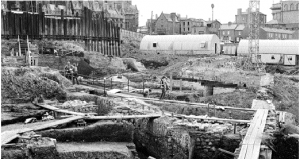 Significant knowledge had been amassed about the archaeological potential of Dublin, first signalled by excavations at Dublin Castle in the early 1960s. The rare anaerobic (oxygen-free) ground conditions were found to have preserved organic material perfectly, the first hint of the spectacular treasure trove that lies buried beneath the streets of historic Dublin. At a time when many household objects were made of wood, these conditions ensured the survival of layer upon layer of urban living from the Viking period and beyond. The remains were astonishing: complete foundations of wattle-and-daub houses; interior hearths and benches; workshops; timber pathways and boundary fences; and even latrines and rubbish pits filled with unique artefacts. What remained was the archaeological footprint of many generations who lived in the bustling international port known as Dyflinn, founded in the ninth century. Wood Quay was known to contain similarly rich deposits, including a stretch of the city wall, and it was always intended to dig the site as part of a general programme of excavation being carried out at other sites in the vicinity. But from the very beginning the time-scale for the excavation was seriously underestimated by the National Museum of Ireland, the pressure intensifying as the contractual construction date loomed. Once on site, significant discoveries were made by the archaeologists, as expected, but when the construction crew took possession some of the archaeological layers were under physical threat. With no sign of a compromise on the horizon, the controversy went legal under the Friends of Medieval Dublin, a small group of (for the most part) academics, chaired by the late F.X. Martin, which had been set up in 1976. Despite the site being declared a national monument in 1978, planning permission was eventually granted after an appeal the following year and plans went ahead to remove the city wall in preparation for construction. When the media attention and mass public protests brought no results, and when a crucial part of the site was bulldozed after the collapse of the legal challenge, dramatic plans were hatched to seize and occupy Wood Quay. Devised and led by the Friends of Medieval Dublin, the site was stormed on 1 June 1979 as part of ‘Operation Sitric’ (named after the king of Dublin, Sitric Silkenbeard) and eventually 52 protestors held the site, supported by thousands of members of the public. While conditions were rough and relations with the construction crew very hostile, it was the decision of the supreme court to uphold an injunction against them that forced the occupiers out, on 21 June 1979. The archaeological excavation resumed for a further two years, until March 1981, and the new offices were finally opened in 1986. Despite the passage of time, the eleven interviews have captured some of the complexities of this multifaceted clash, each from a unique and personal point of view. 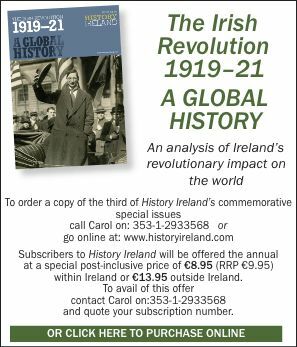 The very beginnings of modern heritage conflict in Ireland are described by Kevin B. Nowlan (Dublin Civic Group) when the site for the Wood Quay offices was first chosen in the early 1960s, the archaeology almost a by-product of an emerging social consciousness. His account contrasts sharply with the robust interview given by Frank Feely, then Dublin Corporation’s City Manager, who was in the unenviable position of trying to modernise the Corporation in the lean 1970s and 1980s. Anngret Simms (UCD) describes the formation of the Friends of Medieval Dublin and its aims and aspirations, while George Eogan, then of the National Monuments Advisory Council, was one of the few professional academic archaeologists who spoke out at the early stages. Richard Haworth, archaeologist and one of the main occupiers of the site during Operation Sitric, tells of daily life during the occupation, while Bride Rosney relates the twists and turns of the legal route taken, headed up by Mary Robinson. Pat Wallace, the director of the excavation, gets us behind the scenes both on the ground and at a political level, his lively account illustrating the delicate balancing act between keeping his bosses happy and getting more time to dig the site. Una MacConville and Nick Maxwell both worked on the site, the latter, in Wallace’s own words, his ‘right-hand man’, and they provide a fascinating insight into daily life on the site for the excavation team and the difficulties they faced from all quarters—including going on strike after the National Museum stopped their pay and locked them out of the site in response to Nick Maxwell and Gabriel Cooney (UCD) obstructing the bulldozers. Finally, Tony Cotter and Klaus Unger, working with Stephenson Gibney Architects, tell the story from the architects’ perspective. The interviews highlight the fact that the Wood Quay controversy is still a live issue for many of the participants, and life-changing for some. While Wood Quay was eventually built over, the project provided an opportunity to update former activists on the significant gains that were made, for instance in changes to planning legislation that now seek to protect the archaeology and built heritage of Dublin, marshalled by the heritage appointments in Dublin City Council, and the active research and publication project by the National Museum of Ireland on the Wood Quay collection. A section of the much-disputed city wall was also preserved deep within the basement of the new offices, which has now been redeveloped and is home to the Wood Quay Venue, a state-of-the-art conference, exhibition and performance facility, which was a recommendation of the Dublin City Walls and Defences Conservation Plan (2004). And in a final twist, this venue is now much used by the Friends of Medieval Dublin, who host free seminars and lunchtime talks in collaboration with the Heritage Officer and City Archaeologist of Dublin City Council. Linzi Simpson is a consultant archaeologist. J. Bradley, Viking Dublin exposed: the Wood Quay saga (Dublin, 1984). T.F. Heffernan, Wood Quay: the clash over Dublin’s Viking past (Austin, 1998). N. Maxwell, Digging up Dublin: a future for our past? (Dublin, 1980). Scannal documentary on Wood Quay @ www.rte.ie/tv/scannal/woodquay.